Coming in April, Part 1 (of 2) of the Theros novel written by R&D Creative Team member, and ex-Uncharted Realms author, Jenna Helland. Godsend, Part 1 will release on April 22, 2014. 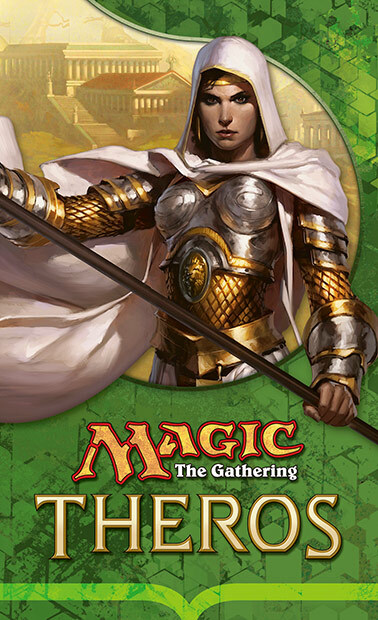 You've been undergoing your own Hero's Path at events such as the Theros Prerelease where you chose your path when picked your Prerelease pack, or at Theros Launch where you decoded the message hidden in the stars, and at the Theros Game Day where you battled the hydra. In this ebook you will get a taste of Elspeth's trials and story as she sought to understand why she had been called to the plane. Godsend, Part 1 is available for Preorder on Amazon.com for Kindle and BarnesAndNoble.com as a Nook Book for $1.99.